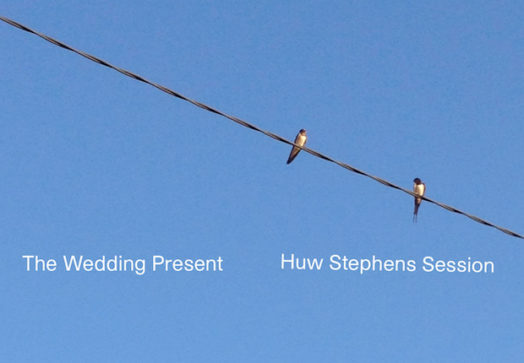 Hatch Records released a new 10" by The Wedding Present entitled Huw Stephens Session on 9 November 2018. This E.P. comprises four tracks recorded for BBC Radio 1 at the legendary BBC studios in Maida Vale, London, on 19 July 2006. “During the summer of 2006 we were invited to record a session for 'One Music With Huw Stephens' - a show on BBC Radio 1. However, this was the year after the 'return' of The Wedding Present and we'd basically been pretty much continually on tour ever since the release of the 'Take Fountain' album the previous year. Accordingly, we didn't really have any new songs of our own and so I decided that we could pursue that other favourite pastime of The Wedding Present... the recording of cover versions! Arranging covers is fascinating, actually, because you get to explore how other people write songs and I think that can often feed back into your own writing. I thought it would be interesting to pick a song from each of four different decades... the 1960s, 70s, 80s and 90s. No particular reason... if we'd've been asked to record five tracks I would have thrown in the 50s, too. So I chose four classic pop songs for us to look at. They weren't particularly 'favourites' - although I have always loved 'Step Inside Love' and 'Lovin’ You' - they were just songs that I thought the band could successfully 're-imagine'. I have never seen the point of recording faithful copies; I have always felt that any Wedding Present version has to bear the stamp of The Wedding Present. And I think we accomplished that particularly well on this session. I'm pretty proud of this E.P., in fact. I remember Graeme Ramsay, our drummer at the time, initially hating the idea of us doing a 'Take That' song but I think he eventually came round to it, especially after The Guardian said it was an interesting 'post-rock' take on the original, or words to that effect..."
You can purchase the vinyl version from Hatch by clicking here. You can purchase the CD version from Hatch by clicking here.